Kartis' Lotro Events - Just for fun. During vacations and other free days I play Lord of the rings Online, a wonderful MMORPG. Since many, many years one of my interests is playing computer games. And Lotro is the main game I have played since 2009. In Lotro I currently have 8 different characters, of which I play 3-4 a little more actively. They all have their own personalities, small pieces of my own. Since I like to fix and organize things in real life, this behaviour also mirrors in a game like Lotro. Therefore I have recently become to organize events, which means activities that aren't necessarily related to fighting. In Lotro there are millions of things to do and only your imagination can limit what to spend your time doing there. When you want to organize an event you also want people to join this event. I play together with a group of people - friends in a "kinship" - but for my events I also want other people to join. Therefore I need to inform all those people of what they can expect from an event, when it is going to be, how to prepare, and so on. That was the main reason to make this website. I created it in one night. Added a little extra the next night. Fast, simple, done. The background picture was already made a long time ago, when I was messing around with the grounds for another site for Lotro. So I didn't need to do much image working. The structure of the site is really simple, and I won't make it more complicated than that. The main importance of the site is to be informative for all those who want to join me in my events in Lotro. 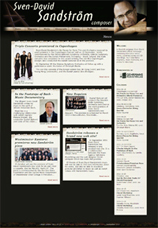 Layout built with CSS, centered window with fixed size. Currently 4 HTML documents and two CSS documents. Simple list menu to the right. Updates as much as I have time for. Probably mostly during vacations from work. Validated with W3C's Validator for XHTML 1.0 Transitional and CSS. Kartis - Fifth complete rebuild of my own website. After building a few new sites and learning a few new techniques, I can't keep from remaking my own site. There is a Swedish saying: "The shoe-makers children always have the worst shoes". That saying applies to me and my own web site, so I really have to rebuild it now and then. This new version was published in November 2011. I wanted it to be completely different from before, in shape, colour scheme as well as functions. I have played with two major colour schemes: Earth-orange and Frost-blue. The two colours kind of represent the two different sides of me as the Gemini I am: Down-to-earth with everyday matters, and also my head up in the sky with tons of ideas that sometimes are confusing. It is also a play with warm and cold in colours, since I am seldom lukewarm. The dark background is not completely black (as always in my sites). It goes from frost-blue-black on the left side to earth-orange-black to the right side, while the colours of the decorations on the main window go from earth-orange to frost-blue in the opposite direction. Oak leaves are decorating the left menu bar as well as they are pouring down from the dark in the upper right corner down into the right information bar. The white background behind the text is of course not completely white, but rather a very light grey colour. I have been pondering about a logo for Kartis in a long while, and the end result is what is seen after the site's name and in the lower right corner. It is a K (as in Kartis), but a very disguised one. It is also the sun shining down on me. The menu is an advanced CSS menu. It is vertical and still the menu items have different positions. The menu items are pictures of me in different ages in life, and the entire picture is clickable. While hovering over the picture it changes from dimmed to clear. Sub-menus appear right below the main menu item, but slightly to the right or left, depending on where the main item is located. A really advanced function with the menu is that I have put in a "you-are here"-status, which means that you can see what page you are at when looking at the menu. The picture that applies to the current page is lit up. A similar "you-are-here"-status is also applied on the sub-menus, but in a more subtle way. For example: you are now visiting the Web design part of my site, which makes the Web design picture be lit up. If you hover over the sub-menus you will notice that "Site show" will not lit up, since that is the sub page you are at currently. Currently about 14 HTML documents and 9 CSS documents. Advanced CSS for left menu. Flash mp3 player for sound clips. Mixed English and Swedish on different pages. Validated with W3C's Validator for XHTML 1.0 Transitional and CSS 2.1. Sven-David Sandström - Swedish composer in contemporary music. Sven-David Sandström's official website was released in September 2011. No composer has made such an impression on contemporary Swedish musical life as Sven-David Sandström. His catalogue of works, which includes some 300 compositions, gives proof not only of an impressive productivity, but also contains an amazingly wide range. In the design of the website I focused on Sandström’s huge production of sacral and choir music during the last years. I have associated from Sandström’s music to colours and symbols in Christianity. The background of the website has different black-grey colours while text backgrounds are light – like the light and darkness in the religion. Brown and beige colours are picked from the portrait of Sandström in the upper right corner, but can also be associated with sand, like in Sandström. In the upper left corner you find a decoration that looks like the sharp symbol in the music, and can also be associated to a crucifix or Jacob’s ladder. I think of it as an augmentation – art’s enhancement – which is well manifested in Sandström’s music. The decorations on the upper edge of the text blocks on the starting page are my free interpretation of stained glass windows and sandstone floors found in old churches. A similar decoration is found in the foot of the web page, but here it is in dark colours instead. 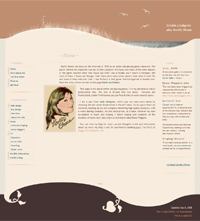 Layout built with CSS, centered window with static size. Currently 11 main HTML documents, 1 sub HTML documents and 9 CSS documents. Horizontal drop-down menu built with CSS. Fixed vertical left sub menus on Works pages, built with CSS. Iframe for Selected Performances - for easier update procedure. Simple Flash mp3 player for sound clips. Completely in English with one page translated into Swedish. Ensemble Ars Nova - Concert organiser of contemporary art music. 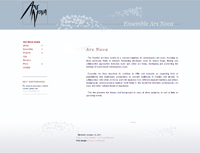 The web site for Ensemble Ars Nova is finally published in January 2011. I started working with it already in 2005, and finished as far it was possible with the material available. The board of the society Ars Nova decided not to publish the site until all material was gathered and put into place on the site. However, the need for the site made it urgent to gather the last parts of the material so it could finally be published in January 2011. The design is very minimalistic, using the square shape of the logotype as inspiration for decorations in the head, foot and title. I have used a chess pattern in the foot (1x1 px grey and white), and had an idea of letting some of the chess squares break out from the pattern, almost as a square revolution. This is my way of illustrating how experimental contemporary music break out from old patterns of music theory rules. The cascades of breaking out squares come back in the website's head and as a title decoration. I have also played with the center point of the site: The geometry on the site builds on 5 columns, whereof the 3 right columns blend together for the main text content. The left-most column is the menu, and column 2 from left is simply empty. All images that exist on the site strive from main block into column 2 to break the emptyness therein. Therefore, the center of the main block has become one center point for "To Top" while the center of the entire site is the center point for information about the page in the footer. This makes the impression of the site somewhat leaning, which - together with chess cascades - makes the look of the site a little playfyl in all its grey and square shape. Currently 19 HTML documents and one CSS. Connect Festival - Festival for contemporary music. During the autumn 2009 I worked with a website for Connect Festival, a site mostly in Swedish. Connect Festival 2009 took place in November and the site was released for this event. Connect Festival is a festival for contemporary music and plays mainly in Malmö, Sweden, during a week every autumn since 2006. The topic for 2009 was “Futurism”. In the design for the website I used typical colours found in futuristic paintings from the beginning of the twentieth century, particularly by the artists Giacomo Balla and Umberto Boccioni. Expanding diagonal lines describe in its minimalism speed and a new way of thinking – parts of the futuristic manifest. However, I avoided being inspired by the more destructive message of the manifest and instead I let the design describe a modern version: belief in future and contact. Currently about 16 HTML documents and 9 CSS. Nils Lindberg - Swedish composer, arranger and pianist. 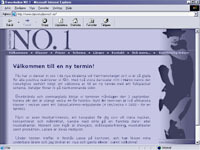 In December 2008 the composer and musician Nils Lindberg's first web page was released. It was a pleasure to dive into the music world of Nils Lindberg. This nice man not only creates beautiful music inspired by the dark forests of Dalecarlia, he is also a fantastic pianist merging jazz with Swedish folk music in all tunes. The choir music he has written are sung well over the entire planet, and is so beautiful that even the angels cry from joy. Obviously the theme for the design had to be something that describes Nils' music. The piano keyboard and dark colour in the top and bottom is for the jazz part of his music. The portrait of Nils in the top is the serious, classical part of it. The folk music is shown in the right edge image of a woven Dalecarlian table cloth. Also you can spot some typical Dalecarlian curbits (flower ornaments) here and there. Currently about 12 main HTML documents, 11 sub HTML documents and three CSS documents. Sound and video pages, both validated and working in all browsers. Completely in English with two pages in Swedish. Rolf Martinsson - Swedish composer in contemporary music. 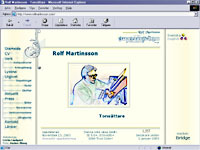 In November 2008 Rolf Martinsson's new homepage was released. Rolf Martinsson's homepage works as the full documentation and encyclopedia of his works, concerts and recordings. It is used for concert producers, media and any interested to fetch information for concert programs, news articles, and other information. This new site is worked in every detail. Every comma, slash and puncutation is well thought-through, as well as all measures are tested pixel by pixel. It works for all newer web browsers. Over 100 HTML documents and one CSS document. A few thousand(!) links, both internal and external. Music samples made with links in iframes. Completely in English with some pages translated to Swedish. Kent Olofsson - Swedish composer in contemporary music. 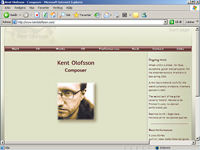 In February 2008 Kent Olofsson's new homepage was released. 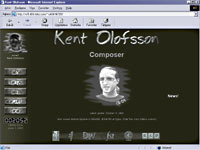 The last version of Kent Olofsson's web site was never really finished due to lack of time from both his and my side. Therefore it never really worked correctly. I rebuild his site again in January/February 2008 and it was more or less finished - and working - in the end of the month. Currently about 15 HTML documents and one CSS. 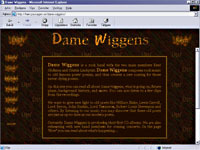 In February 2008 Dame Wiggens' website was released. 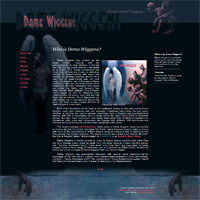 After the release of the first CD - some 10 years after the first plans for the CD - it was more than needed for Dame Wiggens to have a well functioning and professional web site. The old one that I made about a hundred years ago was not at all fulfilling any purposes for a great rock band, so I built a new web site completely from the start. About 10 HTML documents and one CSS. And growing. Background pictures from the cover of "divine images", Dame Wiggens CD. Paintings by Peter Jönsson. 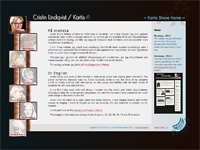 Cristin Lindqvist / Kartis Shone - this site's fourth version. As said before, a never ending story. Just can't keep from remaking my own site. This layout was made in April 2007 and is constantly under some sort of construction. In July 2008 I added a separate photo gallery to the site instead of the very heavy-worked picture gallery that I already had. The old picture gallery was removed later, since all old pictures are transferred and new ones are added into the new gallery. About 25 HTML documents and one CSS. Some new content, features and pictures since second version. 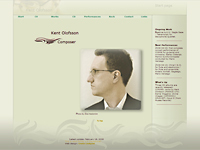 Kent Olofsson needed a total re-organisation and update of his old homepage. It was released on the Internet in March 2006, although it wasn't totally completed. About 20 HTML documents and one CSS. Cristin Lindqvist / Kartis Shone - this site's third version. The third version was finished in October 2005. I changed the top image and made a few other layout improvements from the previous site. The CSS code was also improved. 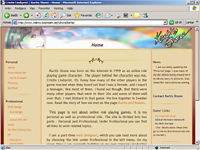 Cristin Lindqvist / Kartis Shone - this site's second version. This second version was finished in December 2004. 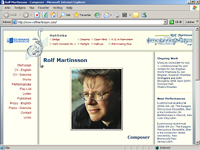 A total rebuild from the first version of Rolf Martinsson's homepage, finished in September 2004. 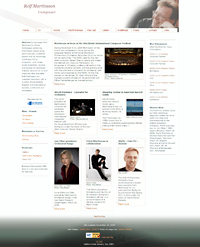 This homepage works as the full documentation and encyclopedia of Rolf Martinsson's works, concerts and recordings. It is used for concert producers, media and any interested to fetch information for concert programs, news articles, and other information. 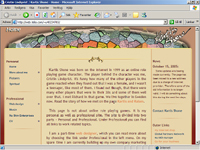 Layout built with CSS, centered window with flexible size. Music samples made in Flash. Theme images for each page. Frame pictures painted by Kartis Shone. Photos by Anders Åberg, modified by Kartis Shone. Not available on the Internet anymore. Dansstudion No.1 - A leading dance school in Malmö, Sweden. Finished in August 2003. 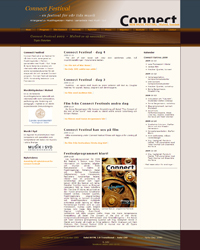 A new web designer took over the updates from August 2005 and re-designed the page. Rather simple, plain transitional HTML site. Contains 9 HTML pages and one CSS document. Cristin Lindqvist / Kartis Shone - this site's first build. A never ending story, but this first design was finished in June 2003. Layout built with CSS, frozen to the left. About 20 HTML pages and one CSS. Validated with W3C's Validator for HTML 4.01 Transitional and CSS. This first version was finished in January 2003. The site was a full documentation and encyclopedia of Rolf Martinsson's works, concerts and recordings. Target visitors are concert producers, media and any other interested. Framebased HTML site with some CSS. Layout completely built with table systems. CSS for colours and font sizes. Swedish version contained 39 pages made of 70 HTML documents. English version contained 1 page made of 12 HTML documents. 1 form page in HTML for Rolf's own updating. Perl-script for simple updating form page, to make it possible for the composer to update some of the pages from home. Theme images for each page. Frame pictures painted by Kartis Shone. Photos by Anders Åberg, modified in Photoshop by Kartis Shone. 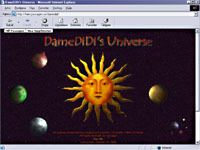 First version made in April 1999. This homepage was as an information page about Kent Olofsson's works. It is a "friend-to-friend-project". Kent Olofsson has a new site on his own domain. You will find it above in the site show list. Framebased HTML with some CSS. Layout designed with table systems. CSS for some colours and a few font sizes. Contained 7 pages made of 22 HTML documents and one CSS document. Images on front page painted by Kartis Shone. 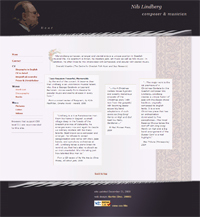 Kalam Shone's home - Richard's homepage. 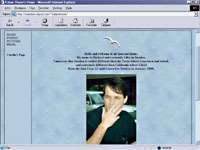 A remake in March 2000 from Richard's first try to make a homepage. He wanted it very simple, almost too simple in my opinion. But I changed some colours, fonts and made a background picture for it to make it little less hospital-grey. It contains some of his poems which he wrote before he moved to Sweden. Really good poetry. It is worth a visit just because of the poems! More or less no updating. Dame Wiggens - Rock band. Finished in April 1999. Actually a really murky site. I was in to noisy background pictures and liked to play around in Photoshop a lot, not always with the best results. I liked the site when I made it. Layout built with frames and tables. Music samples in fun Flash movies (works ok even though they are a beginner's first try). Moved to this domain in August 2008. DameDiDi's Universe - my first homepage. You can read more about all that on the News Planet's Old news at DameDiDi's Universe. I still think the front page is cool. It's absolutely unique. I was extremely proud of this site since it was a huge work with many pages, each page with a different colour theme. I had a small beginners HTML book in which I tried to find the solutions for what I wanted to create. I had to experiment with almost everything, since the book didn't tell me the whole story about HTML. I learned table systems and frame systems with this site. Looking at the code almost make you laugh if you know HTML, it is just too complex! The reading could be somewhat fun perhaps. I have used some of the text material from DameDidi's Universe in this new Kartis Shone site. It is a piece of history for me. Animated gifs on front page. Each "planet" (subject) has its own colour theme and frame. No updates. 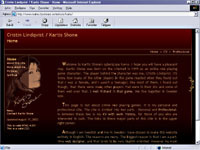 Is moved to Kartis Shone's domain in August 2008.